Ed Sheeran has suggested a way of increasing the world’s population of ginger people. 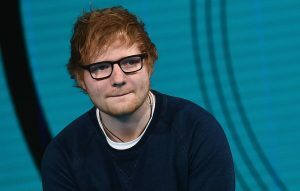 Sheeran was being asked by the Studio Brussel host how he would go about protecting “an endangered species.” She suggested they procreate, and handed him framed photographs of their future children, saying: “Knowing that you have the ginger gene and I have the ginger gene…” She then handed him her phone number. “It is to save the ginger race.” Watch the interview below. Meanwhile, it has emerged that Sheeran has given songwriting credits to the writers of TLC’s R&B classic, ‘No Scrubs’, because of alleged similarities with his Number One hit ‘Shape Of You’. This week, ’80s favourite Rick Astley has covered ‘Shape Of You’ on his latest tour. Ed Sheeran goes on tour this month – see dates below. The post Ed Sheeran makes suggestion on how to increase world’s ginger population appeared first on NME.